Conclusion & Surrender - In just eight days, the war was brought to a close and the Argentines surrendered their forces on West and East Falkland. But before they did, the FAA, in one last major effort damaged frigate "Plymouth", sank one of "Fearless'" LCU's, mortally damaged LSL "Sir Galahad" inflicting heavy casualties on the 1st Welsh Guards, and nearly put paid to "Sir Tristram". Apart from the later hit on destroyer "Glamorgan" by a land-based Exocet, these were virtually the last losses in ships or aircraft. Mount Longdon by 3 Para, Two Sisters by 45 Cdo, and Mount Harriet by 42 Cdo. Wireless Ridge to 2 Para so soon after Goose Green, and Tumbledown Mountain to the 2nd Scots Guards. And meanwhile the 1/7th Gurkha Rifles stood by ready to attack Mount William, and a depleted 1st Welsh Guards, reinforced by 40 Cdo, prepared to occupy Sapper Hill. In the event, the surviving Argentine troops streamed back to Stanley where they still outnumbered the British attackers, but throughout Monday 14th, a surrender was negotiated, timed to take place from 9 pm local time. But still more ships, aircraft and supplies were needed. Task Force Departures from Monday 7th June - During the week, four merchantmen headed south. On Tuesday from Plymouth, "Astronomer" set out as a helicopter carrier and repair ship with a variety of helicopters and additionally equipped with 2x20mm Oerlikons, chaff launchers and a Unifoxer acoustic torpedo decoy. Leaving the same day was ammo ship "Laertes", and two days later tanker "G A Walker". Refrigerated stores ship "Avelona Star" sailed at this time from Portsmouth loaded with food. Then on Sunday, cargo vessel "St Helena" sailed from Portland after working up as a minesweeper support ship. Armed with 4x20mm Oerlikons, she accompanied Hunt class mine countermeasures vessels "Brecon" and "Ledbury", the first Navy minesweepers to leave for the Falklands. Next day, the reloaded tanker "British Avon" sailed from Portland for a second voyage south. Meanwhile more ships arrived back in the UK. By far the most publicised was on Friday 11th when "Queen Elizabeth 2" sailed into Southampton with the survivors from "Ardent", "Antelope" and "Coventry" to be met by Royal Yacht "Britannia" carrying Queen Elizabeth, the Queen Mother. Nuclear submarine "Splendid" got in to Devonport the next day. By then tanker "British Esk" was back to reload, and as the surrender took place, "British Tay" approached British shores. Ascension - There was no let up at this one and only advanced base (other than South Georgia), especially on the part of the RAF. On Tuesday 8th, the last two Harrier GR.3's flew direct to "Hermes", and on Friday, "Black Buck 7" was launched - the last Vulcan raid on Stanley and again using conventional bombs. The aircraft returned safely next day. Also returning, but to the UK was destroyer "Glasgow" which passed through the area early in the week, followed by frigates "Alacrity" and "Argonaut" around the time of the surrender. South Atlantic - Tuesday 8th saw the only non-belligerent casualty when two Grupo 2 Canberras mistakenly bombed the American-registered tanker "Hercules" then on passage to the north east of the TEZ. On putting into Rio de Janeiro, a UXB was found that was too dangerous to disarm, and the ship had to be scuttled off Brazil in late July. 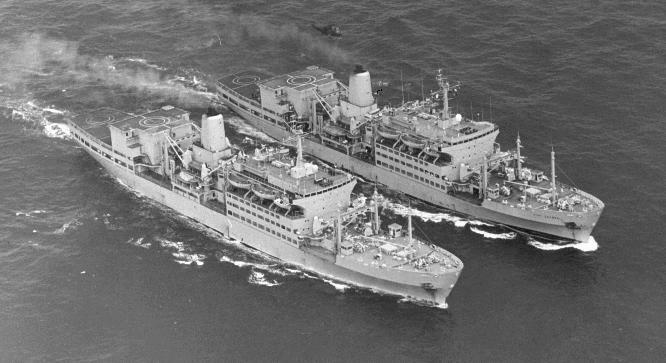 Fortunately the FAA's attempts to hit the British lines of communications were unsuccessful as later in the week, tankers "British Test" and "British Trent" sailed north for Ascension carrying the survivors from "Sir Galahad" and "Sir Tristram" respectively. In the Falkland's area itself, the hard-worked transport "Norland" headed out of San Carlos Water on Monday 7th with a thousand Argentine POW's bound for Montevideo, and got in over the weekend. Aircraft and helicopter carrier "Contender Bezant" reached the TEZ on Thursday with her Navy Sea King, Marine Gazelles, and RAF Chinooks and four GR.3's too late to join in the fighting although the helicopters were needed to help in the clearing-up. Over the weekend, transport "Tor Caledonia" reached the TRALA to start offloading stores and just after the surrender, transport "St Edmund" reached the CVBG. On the same day, Tuesday 15th, nuclear sub "Conqueror" left for the UK after her active eight weeks of patrols in the South Atlantic, while frigate "Yarmouth" and RFA "Olmeda" headed in the opposite direction, first for South Georgia on their way to re-occupy Southern Thule. Well before then, on Monday 7th, the first RFA south, "Fort Austin" was returning north for Devonport and England. South Georgia - This almost Antarctic island, still garrisoned by M Coy 42 Cdo and attended by "Endurance", saw more comings and goings. "Wimpey Seahorse" arrived to lay out moorings at various anchorages, RFA "Regent" got in from the TEZ to replenish from refigerated stores ships "Saxonia" and the newly arrived "Geestport", and at the time of the surrender, "Scottish Eagle" was heading there as base storage tanker. Well before then, RMAS tug "Typhoon" had left for the TRALA, as had ammo ship "Lycaon", and over the weekend, "Saxonia" sailed for the UK to reload after her three weeks at South Georgia.